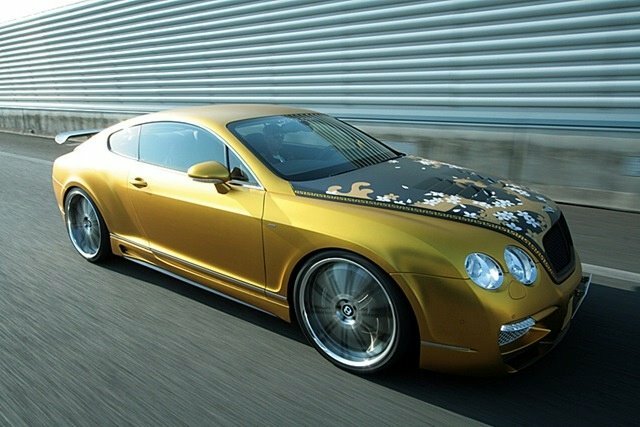 The Bentley Continental GT is an amazing car with its 6.0 liter twin-turbo V12 engine pumping out 552hp, it is a favorite with the rich and famous including one Paris Hilton. She could well be happy after news of of this new tuning kit from Japanese tuning firm TSI featuring a golden livery complete with flowers all over the hood, surely there is only one person in the world who could feel at home in this. Despite this sacrilege the Japanese tuning house has at least gone to work to create a more aggressive wide body kit made of ASI’s dry carbon. The engineers have also tackled the engine by enhancing the turbochargers and exhaust system along with a bit of ECU tuning bringing the total output to an over-the-top 800hp. To handle this extra power the transmission also required a bit of strengthening. As we enter the electric car age, it is good to see the piston age so well represented. This will make an admirable museum piece, to display along side the Pratt and Whitney radial piston aircraft engines and Cummings diesel truck engines. My grandchildren will love seeing these monstrosities from the past as they scoot about in their depleted uranium battery powered cars and work at balancing the biosphere for human survival.